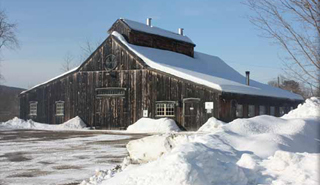 Our 100% pure Massachusetts maple syrup is produced each season in our family's Deerfield sugarhouse. 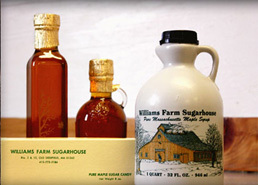 We offer four (4) grades for purchase: Grade A Medium Amber (our favorite and the most popular grade of table syrup), Grade A Light Amber (a mild, more delicate flavor and best for candy or cream), Grade A Dark Amber (stronger maple flavor), and Grade B (strongest maple flavor and best for cooking and baking). 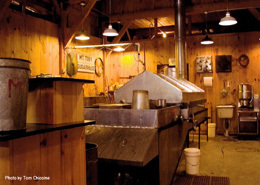 A sweet treat made with pure maple syrup. Nothing added! 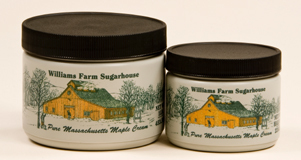 We offer three (3) sizes of individual leaves: mini leaf (1/2 oz. ), medium leaf (3/4 oz. ), and large leaf (1.7 oz). 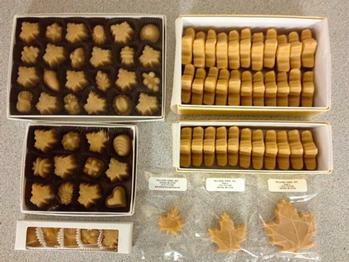 **MAPLE CANDY IS LISTED AS 'SOLD OUT' IN LATE JUNE, JULY AND AUGUST AS QUALITY IS COMPROMISED BY SHIPPING IN THE HOTTEST SUMMER MONTHS. 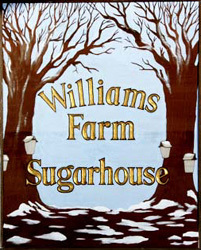 For local pickup at the sugarhouse, call 413-773-5186. This maple spread may be buttery and creamy, but it does not include any dairy products. It is dairy free! (And again, nothing is added!) Try it on toast, waffles, pancakes, english muffins, cookies, or right out of the jar. The large gift box contains: 1 Quart of Grade A Medium Amber Maple Syrup, 1 pound of Maple Cream, and 1/2 pound of Maple Sugar Candy. 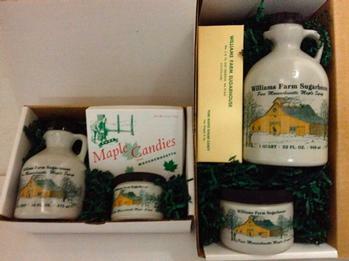 The small gift box contains: 1 Pint of Grade A Medium Amber Maple Syrup, 1/2 pound of Maple Cream, and 1/4 pound assorted Maple Sugar Candy. 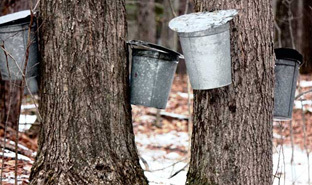 If you love maple syrup and are looking for new, delicious recipes, this cookbook is for you.